This collection of magic items clocks in at a massive 30 pages, 1 page front cover, 1 page editorial/ToC, 1 page back cover, 1 page SRD (though the SRD-page sports two short paragraphs of content), leaving us with 26 pages of content, so let’s take a look! So, these magic items are intended for the unique Vikmordere-culture in Aventyr, which can be likened to a unique blend of native Americans and Vikings. It should be noted that adaption of the items to other contexts and cultures is pretty simple, though, personally, I’d consider that to be a bit of a waste – you see, the Vikmordere culture slowly introduced over the course of multiple modules set in Aventyr, may easily be the most intriguing ethnicity/culture I have seen introduced for a given setting in a long, long while, so finally getting magic items to further accentuate its peculiarities is a big plus for me. And yes, I actually wrote them into my current main campaign; you know, the non-playtesting one where we play for fun and fun alone? The one I really guard against influences I don’t absolutely love? Well…yeah. That should give you an inkling of how much I like this culture. I’m rambling, right? Sorry. But this goes somewhere. Beyond simply depicting magic items as in other sourcebooks, the pdf has several peculiarities. Number one would be the correspondence of the items to magic item cards – while not necessary for the enjoyment of this book, the item cards do provide a welcome option for time-starved GMs to simply hand out and the fact that the items denote their cards makes this very easy to use. Beyond that, and here is where my rambling above comes into play, each item actually comes with cultural information pertaining the magic item and its function, use and status within the Vikmordere culture, featuring unique tidbits while hearkening to a school of design that is not about math, but about myth-weaving. Suffice to say, I adore this decision. Anyways, the items also get their own descriptive flavor text (great for GMs who are bad at that kind of thing)…and, well…they have artworks. Not a couple of them. I mean gorgeous, high-quality full-color artworks for each and every item in this book, featuring Mates Laurentiu’s unique and very fairy-tales-esque style…that actually manages to get the flair of the Vikmordere. Okay, so this may be impressive, right? Well, it kind of is…but personally, it’s the items that make this interesting. We begin, for example, with Amphorae of Wargmead which allow the imbibers to assume Powerful Shape-modified wild shape into Large dire wolf form. Yes, this basically is akin to a spell in a can – but it does modify the precise effects and the visuals it evokes and the cultural tidbits conspire to make this infinitely more compelling than it would be otherwise. The expensive and powerful armet of glory provides cumulative deflection bonuses to AC for each crit confirmed -and guess what? The item actually navigates, rather well, I might add, the issue of per-combat mechanics by also providing a fixed time frame. Kudos! Basher’s Shields are also interesting -two enchanted bashing shields that work in conjunction and allow the user to fuse them together into a tower shield-equivalent of their own, with bonus feats granted to the wielder while wearing the shields. Pretty unique. The berserker’s boss actually contains three shields with unique properties, with in particular the trickster-shield being brutal: No save 1/day exchange of places with a creature attacking the wielder. On a nitpicky side, the shield should probably specify that the exchange is a conjuration [teleportation]-effect for purposes of ability/spells interaction…but the daily limit makes me still consider this cool…and functional…and unique. Bows that facilitate firing multiple arrows at once (with Manyshot-interaction covered) may be cool…but what about boots that automatically create ice when the wearer treads upon water? And yes, the rules for this are more complex than one would think from the concept, but ultimately, it manages to handle them; it works. Brynja Mail, originally worn by a demi-goddess, changes hues depending on temperatures and is particularly potent for superhumanly dexterous characters, with potent defensive capabilities. This may be a bit inexpensive, but considering the origin and scarcity of this armor, I have no issue with it. An iron censer that doubles as a flaming flail for Large-sized creatures, capable of warming the cold, should also be mentioned, What about a fan made of hawk feathers, assisting in the conjurations of rituals? Hero’s blood as a powerful potion (with an optional rule that makes it less palatable…) and hero’s hope is similarly unique: A horribly amateurishly cobbled together buckler that is enchanted to 1/day, make the user basically immune to ranged attacks, negating hostile assaults…though the shield does collapse upon absorbing a critical hit as a unique balancing mechanicsm for its power. Beyond a cursed horn of thirst, an electricity-laced reindeer seax that doubles as a lesser elemental metamagic rod. Now here’s a glorious one: The hunter’s haversack can create items beyond its obvious storing capacity. However, it manages to get EVERYTHING right! It can’t be cheesed for money; It can’t be cheesed to create custom, specific items…and retains full functionality! Oh YES! Thank you! You know, this may be the first crazy-prepared item I know of that does not have any issues! A halberd fashioned from mammoth tooth can conjure forth a mammooth to ride and an instrument can conjure forth ratatosks (see Vikmordere Bestiary) and bodhran drums can carry messages for miles. Runestones of warding deserve special mention – a total of 16 such stones are provided. They each have a pool of charges and basically work like more versatile ioun stone array that provides bonuses versus specific schools/subschools of magic, with each bonus granted consuming one charge. On a nitpick, they use the nomenclature “rune bonus” sans defining rune bonus for stacking/interaction purposes. Ähem: “This ornamented human skull has had a circular hole cut into its crown, trimmed with a rune-covered gold band. Its jaws have been positioned so that the mouth remains gaping wide open, and two large pristine rubies have been lodged into its gazing eye sockets.” – That’s the skriksong. In the presence of haunts or undead, it emits a conical, fiery glow that can render the incorporeal corporeal and acts as a glorious warning system for haunts. And, come on – the imagery evoked…it’s…stunning. What about a spiked, dancing buckler that can be thrown? Or what about a massive, magical snekkja (a type of longship) that is crewed by spirits and that can turn all abroad incorporeal…yes, this is, quite literally, the stuff of legends. The potentially petrification-causing gorgon ability is underpriced for a +2 bonus in my book. Vængr throwing axes can generate gusts of wind or wind walls – nice, but personally, I *love* the magical wenchline of hoisting, a variant of an immovable rod that, bingo, help hoisting! Makes *so much* sense to me! Neat! Oh, and have I mentioned the ice-genie in a bottle? Editing and formatting are very good in both the formal and rules-language departments – I noticed no significant glitches. The full-color 2-column, unique layout standard created for this book by BJ Hensley and Daniel Marhsall is GORGEOUS and, as mentioned above, the artworks are copious and stunning. The pdf comes fully bookmarked for your convenience. 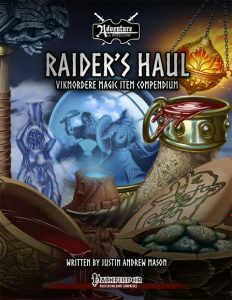 Justin Andrew Mason’s Raider’s Haul may well be one of the best magic item books I’ve seen in a long while. It certainly is the most beautiful one – the artwork-density and quality of the artworks is stunning. While I’m not sold on the pricing of all items herein, that remains very much a personal thing, though some enchantments and bonuses herein very much feel like they shouldn’t be crafted in series. Why? Because this, in its design and culture, in the glorious fluff suffusing this book, very much adheres to the mythical take on magic, where it is supposed to instill wonder, provide unique benefits and not like something that can be bought at adventurers-are-us. If taken under this, its intended purpose and premise, this may well rank among the finest item collections for PFRPG. If you take the story-components out of the items and make them widely available, you also deprive them of some of their magic – of their uniqueness and flair. The two components I thus consider problematic are the relatively powerful magic weapon qualities contained herein, since they imply a wider availability. However, this book, as a collection of culturally distinct loot with its own stories and flair, is frankly intended for the GM, as a great selection of tools to reward heroic PC. Used as such, as intended, this works perfectly – powerful and unique, breathing the flair of its unique culture. As you all may know, I am a rather big proponent of “magic should be magical and not something you buy in the market” – so for me, this absolutely and completely does its job in a truly superb manner; in the context of Aventyr, this steps up the game for magic items and the coolness of the unique Vikmordere-culture. Beyond its setting-confines, it remains a stellar collection of items for Norse-inspired cultures that breathe a sense of the uniquely magical into fantasy rendition of Viking-inspired cultures, going one step beyond the tropes evoked in classic Norse mythology, adding a unique and creative spin to everything. In short: I absolutely adore this book. It’s an achievement of storytelling that provides items that feel more magical than most PFRPG-items, that feel like items that are more than the sum of their math and properties. For that, I love this book and while it may not be 100% perfect, it is very close to that…at least for me. My final verdict will hence clock in at 5 stars + seal of approval. Want the cards? You can get those here on OBS!